I hope you enjoy my latest interview as much as I did. 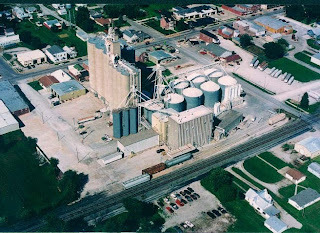 Rick Siemer and his family have run a very successful milling operation in Teutopolis (near Effingham) for over 125 years. I was very interested to learn why. After all at the turn of the century there was a flour mill in just about every town. There were literally thousands of them! Today that number has been diminished to just over 100 operating mills in the country. And guess what? Siemer Milling is number 15 in the entire country! Right here in our area we have one of the most successful milling operations in the nation. The interview reveals Siemer's management philosophy and gives insight to the corporate culture that allowed them to endure through two world wars and the great depression. They really have a story to tell and its rich with a history of the mid-west, with a people and an outstanding family. Its worth the time to watch! Watch now! Good to know that there are still businesses doing great which continuously provides jobs to people. Thanks for continuously sharing real estate news and articles here that are really delightful at times. Good luck.